Most read as ranked by Google Analytics page views. The State of the Blog is healthy despite the dearth of original posts in the second half of 2013. twitter Followers increased 51% to 6571 via organic growth although Blog RSS and email subscribers declined almost 20% per FeedBurner. Here are the Top 10 GUNTHER Portfolio photovoltaic (PV) posts from 2013 as ranked by Google Analytics page views and presented in Late Show with David Letterman Top 10 List reverse countdown order. 10. Nanosolar’s Complete California Facility Closure Auction – After years of hype and progress, Nanosolar folded with a whimper and failed one of my 2013 predictions. 9. First Desert Sunlight Solar – project progress always attracts attention since First Solar does not comment on percentage completion questions. 8. The Soitec Concentrator Photovoltaic Newberry Springs Uprising – The Newberry Solar 1 project irked a few residents and triggered a San Bernardino County policy review of commercial solar plant siting near residential areas. 7. First Commercial SunPower C7 Tracker Project Lags – The C7 Tracker Project was dedicated by SunPower and their partners three (3) months later. 6. Photovoltaics: 10 Trends to Watch in 2013 – will be reviewed in my 2014 update but don’t expect that before February again. 5. Soitec Concentrator Photovoltaic Factory Grand Opening Tour – took almost two (2) months to post but included Newberry Solar 1 project details. 4. BP Solar’s last unsustainable Act – BP Solar’s old building was demolished without recycling the photovoltaic modules. 3. New SunPower Solar Cell Discoloration Anomalies at the Photovoltaic Demonstration Project – have not been explained and a site revisit is long overdue. 2. Photovoltaic Conference and Exhibition Preview 2013 – The annual post is popular with folks looking for concise, independent conference and tradeshow guidance. 1. Abengoa Solar Solana Generating Station Sortie – These photos have attracted more interest than any I have ever captured. 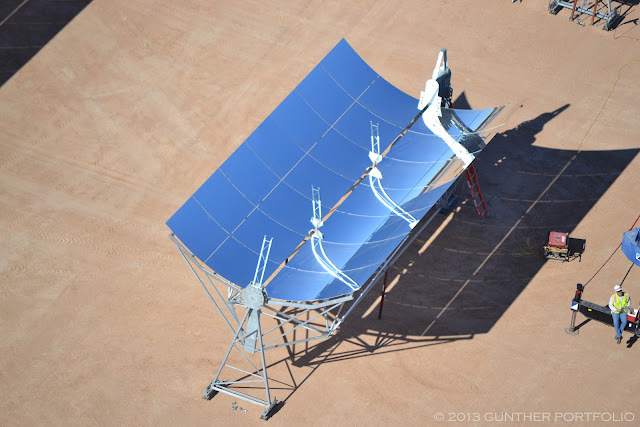 Abengoa requested the removal of two (2) detailed parabolic trough and assembly photos! Please see the Top 10 GUNTHER Portfolio Photovoltaic Posts of 2012 for the prior year’s top posts. I wish everyone a fabulous green and clean Happy New Year in 2014 with health, happiness, and prosperity.